Mark Hall (Right) and Alex Marinelli (left) in the 2013 GFC Semifinals. Both enter this weekend as #1 seeds at the NCAA Tournament. 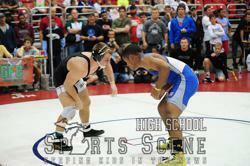 The Grappler Fall Classic will be held next October in Michigan for the 10th straight time. As the tournament has evolved over the last decade into one of the premiere elite pre-season national wrestling tournaments in the country, you see more and more former GFC standouts having success on the college scene. This year there are a total of 29 former GFC participants who will be wrestling this weekend in Pittsburgh at the NCAA Championships, including top seeds at 165 and 174lbs, Alex Marinelli (Iowa) and Mark Hall (Penn State) who wrestled each other at the 2013 GFC. Read below for the list of GFC alums to watch this weekend and check back at www.GrapplerFallClassic.com in the next couple weeks for finalized info on the 2019 GFC.